By the end of the workshop, the only thing left for you to figure out is the topic of *your* museum's first recording. How To Create A Podcast: Step-By-Step. Well, first off, despite the word that has come to popularize them, you don‘t need an iPod to listen to a podcast! At the end of the day, a podcast is simply an audio file that you can download and listen to on your computer or MP3 player. If you have an iPod, it‘ll work. If you don‘t, Windows Media Player, iTunes, or any number of other software applications can play them too. 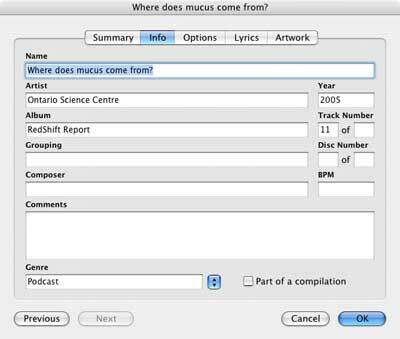 Basically, if you‘ve ever downloaded music on your computer, you likely can listen to a podcast. A podcast is like a radio program of sorts, but one that you or anyone with a computer and a Web site can make and distribute on your own. So, Is Every Audio File A Podcast? Nope! But the difference between a podcast and other audio files isn‘t the file itself, or even its content. Typically, the audio file that comprises a podcast is a standard MP3 file, the same sort of file that‘s commonly used on the Internet to save and download music. The difference is that to be a podcast, in addition to the MP3 file, you need to list it in an RSS file and make that RSS file available for download from your Web site as well. I‘ve Just Learned "Podcast". OK, So What‘s "RSS"? Simply posting MP3 files on your Web site would require that visitors return to your site periodically to see if you‘ve posted a new one. That works, but what‘s special about podcasts is that with the right software, they download automatically to your visitor‘s computer every time a new one appears. This automation is done by including details of your podcast in an RSS file and making that file available on your site. RSS is an acronym for "really simple syndication". Details of them below, but simply, an RSS file is a text file that lists the file name of your podcast, the author, the subject, the date… basic information about the recording. When a visitor "subscribes" to your podcast by adding the address of your RSS file into their podcast software, the software will periodically – automatically – revisit your Web site, download the RSS file and check if any new recordings have been added to it. New recordings are then automatically downloaded. The benefit to podcasters is that the audience returns day after day, episode after episode, so long as they keep your RSS file listed in their software. At the Ontario Science Centre, we‘ve chosen to start podcasting by creating a weekly five-minute "question and answer" show. Truth be told, even before we started encouraging visitors to send in questions, they were anyway. In the past, a staff scientist would research and prepare an answer and email it back to the visitor. On The RedShift Report we take those same questions, but instead of e-mailing back answers, we now bring the scientist and a host together and record a short interview between them where the question and its answer are explained. Basically, without a lot of additional work, we‘re doing much the same as we did in the past. Only now, it‘s to an audience of thousands, instead of one-to-one. Enough Explanation. Let‘s Make One! Start with an ordinary MP3 file. List that MP3 file in an RSS file. Make both available on a Web server. Encourage visitors to "subscribe" to the RSS file. To make the MP3 file, there are a number of free and low-cost audio recording packages available. If you are working on a Macintosh, Apple‘s "GarageBand" (http://www.apple.com/ilife/garageband/) has recently become a popular choice; however, the free "Audacity" is available for both Macintosh and Windows (and other) platforms and works equally well (http://audacity.sourceforge.net/). 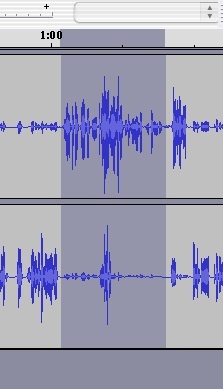 The following describes the recording process using Audacity. While the buttons and menu options may change depending on the software and platform used, the process is pretty much the same. Plug a microphone into your computer and open Audacity. With everything connected, there should be a display of the "levels" showing on the right. As you speak into the microphone, the level should move back and forth. The best sounding recordings comes when the level comes as near as possible to the far end of the graph but doesn‘t touch it. You may need to adjust the microphone, switch to a better one, or simply alter the recording volume to make this happen. It will likely take a lot of trial and error! With the format of The RedShift Report being a one-on-one interview, we typically set up two microphones, one on the scientist and one on the host. Some folks speak more softly than others; two microphones allow us to make one voice louder or softer as necessary. Once the levels are set, press the red "record" button, and start talking! Don‘t panic. Don‘t rush. And don‘t worry about mistakes (too much). Of course, it‘s great if you can get it all right the first time, but if someone flubs a line or needs to make a correction, you can edit the recording afterwards. Once you‘ve recorded the audio, press the "record" button again to stop recording and save the resulting file. At The RedShift Report, we‘re almost at the point where a five-minute recording takes five minutes to record. For the first few episodes, though, there were lots of flubs and "ums" and "ers" and we‘d be recording about twice as much as we ended up using. Fortunately, that"s where editing comes in. 2. Editing: Make It Sound Good! Once you"ve completed your recording, you"ll end with a long audio track. If you"ve recorded with one microphone, you‘ll likely have one squiggly line. If you‘ve recorded with two microphones, you‘ll have two. 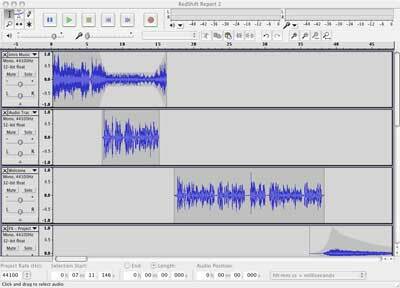 Fig 5: Audacity displaying a recording from two microphones. The scientist has is the line on top, the host is the line on the bottom. By looking at the gaps in one line vs. the other, you can "see" where one person stops talking and the other begins. Click the green "play" button to listen to the result. To play from someplace other than the start, simply click anywhere on the track before clicking "play". As the track plays, a green progress bar slides across the top indicating the current position. If you hear a flub, press the stop button, and then drag your mouse across the offending area to select it. With an area selected, click the Edit menu and select Cut. Your selected area disappears. At The RedShift Report, we‘ve found it best to be succinct, be upbeat, and keep a variety of "sounds" on-air. Listening to talk-radio, you don‘t get many examples of long speeches, monotone voices, or rustling papers. During the editing process, you have the opportunity to take out and shorten up such things. The idea isn‘t to remove content – it‘s to ensure the focus remains on the core ideas you‘re trying to convey. It can be excruciating work, but taking the time to make the edit right makes for a program that‘ll be appreciated by the widest possible audience. In order to make The RedShift Report feel more like a "real" show, we had a talented staff member record an intro theme for it. For fun, we also tend to include a few sound effects and clips from other recordings when mixing an episode. 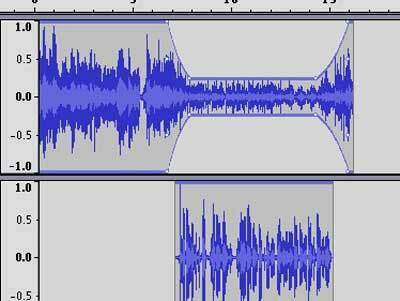 Audacity lets you "layer" different sounds on top of one another. 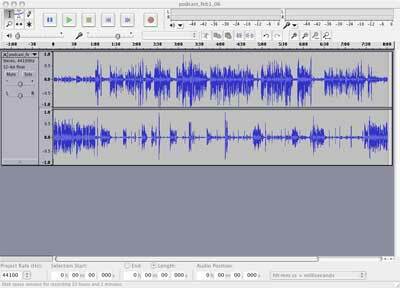 In fact, during the recording process, if you stop recording and start it again in the same file, you can see Audacity automatically create a new layer to contain each additional recording. To add a new sound into your recording, select the Project menu, then Import Audio… and choose your file. Two other tools in Audacity now become important. The Envelope tool allows you to change the volume of different parts of the recording. If you want one sound to fade out, or another to fade in, adjusting the envelope allows you to do so. Click the Envelope button on the toolbar. (It's indicated with two up-and-down arrows pointing at a line.) Each layer in your sound file will now be shown with a thick blue bar across the top and bottom of it. With your mouse, you can now grab and drag the blue bar higher or lower. Dragging higher makes the sound louder; dragging lower makes it softer. To make something fade out, click the blue bar at the end of a clip and drag it down, right to the bottom. Then, a little bit back from the end, click the bar again and drag it higher. What you should see now is your clip staying loud until just near the end, at which point it descends down to a low volume. In the example below, we‘ve done this twice: once so that the clip gets softer in the middle, then a second time so it becomes louder at the end. Click the button in the toolbar. Once selected, you can then click and drag your clips back and forth in time. This way, you can have the music start at the beginning and be followed by your voice recording. Continue editing, enveloping and time shifting your recording until it sounds the way you want. A five-minute episode of The RedShift Report can take an hour or two to edit and mix, depending on how complicated the sounds we‘re incorporating into it. Typically though, it can be done in about half that time. 4. Encoding: Export and Compress. From the File menu, select ‘Export as WAV…" and give a file name. Once your WAV file has been saved, we‘re done with Audacity. While it can do a whole lot more, for our purpose it‘s just to take Audacity‘s WAV file and from it create the final distributable MP3 file. Depending on the content of your show, you may wish to adjust the 64 kbps to a higher – even stereo – value. Different settings may make your resulting file sound better; they‘ll definitely make it larger. As The RedShift Report is primarily talk, 64 kbps (mono) seems to be a good trade-off between the two: quality and file size. Back in iTunes, drag your WAV file into the main window. 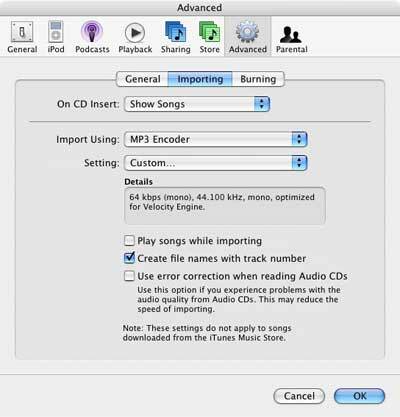 Right click it and choose "Convert selection to MP3". Once the process has completed, right click the new file in iTunes and select "Get Info". Here, you can fill in details about your MP3: name, artist, album, genre, etc. This step isn‘t necessary, but for visitors who play your MP3 on their computer, this will control what is displayed in their player while listening to it. Click "OK". Drag your file from iTunes onto your desktop. This is the file you can upload to your Web server, e-mail to your friends, and share with the world. We‘re done the first bullet. The last three are much easier. They may look intimidating, but RSS files are simply text files, so can be created in Notepad, SimpleText, or any other editor you prefer. <itunes:explicit>Does your podcast include explicit content? Add this new piece between the </channel> and </rss> lines and save the file. Each time you add an episode of your podcast, simply add a new item to the file to make it available to your visitors. It‘ll let you know of any issues. With a valid RSS (XML) file, and the MP3 file we completed earlier, you‘re done! Place both on your Web site, and you‘re all set. Of course, even the best podcast is no good without an audience. Linking to the podcast from your own Web site is certainly the way to hit your target audience, but a wider audience can be achieved by submitting the URL of your RSS feed to any number of (free) podcast directories. While it may seem that there are as many directories of podcasts as podcasts themselves, (take a look at http://www.podcast411.com/page2.html for a few examples!) there are a few that are more "popular" than others. How many directories you submit your RSS feed to is up to you: the end goal though is to encourage folks to subscribe by adding the URL of your feed to their podcast software. As the software will regularly access your Web site and download the RSS feed to see if any new podcasts are available, a podcast you release one night might have hundreds of downloads by the next morning - not as the result of humans visiting your Web site and downloading it, but because their podcast software has automatically done it for them behind-the-scenes. Fig. 15: Downloads of The RedShift Report, January 2005. 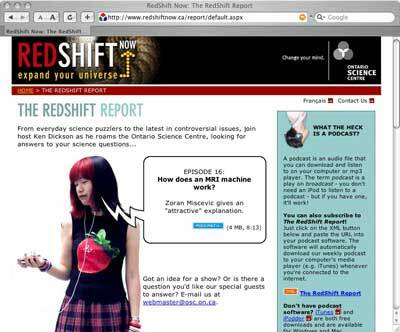 We typically make new episodes of the RedShift Report available on a Friday night. By Monday morning, about 400 downloads of the MP3 file typically go out.